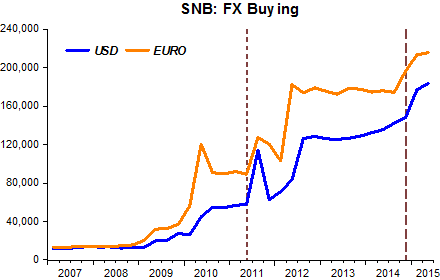 Some Fed watchers took heart when Stanley Fischer, smart guy and former Israeli central bank chieftain, took the No. 2 slot at the U.S. Federal Reserve in 2014. After all, Fischer had guided Israel through the 2008 global tight-money debacle, by using his central bank to counteract the worst effects of the worldwide slowdown. Fischer printed shekels, and it worked. But the Fed has dybbuks (spirits), which have taken over Fischer. Some call it the Fedborg. 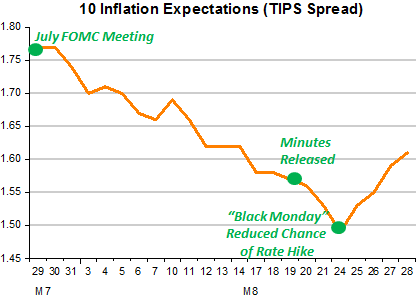 “Given the apparent stability of inflation expectations, there is good reason to believe that inflation will move higher as the forces holding down inflation dissipate further,” Fischer just yesterday told the ongoing Fed confab in Jackson Hole. Really? What stability is that? There in fact seems to be a stable trend on the two charts—downwards, that is. Of course, I can remember when the markets anticipated double-digit inflation, and homebuyers took out 18% mortgages in the United States. 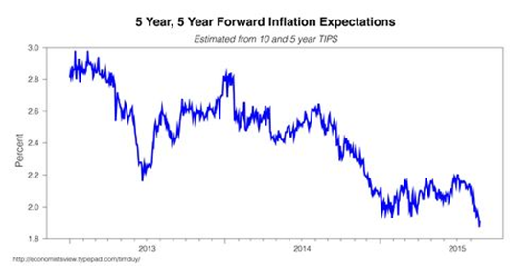 So what makes inflation expectations stable? 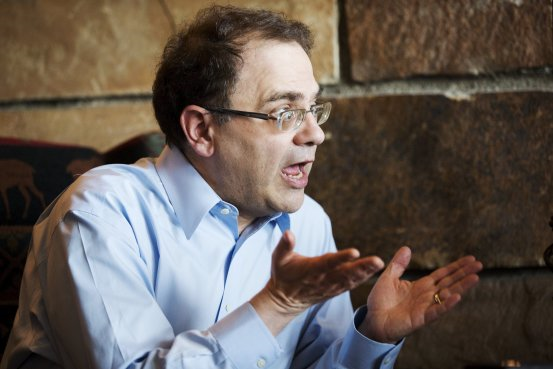 If the Fed would raise rates now, when would it not raise rates? We live in strange times, when a hysterical squeamish prissiness about microscopic rates of inflation passes for monetary policy. Remember the much-loved “Inflation Fighter” President Ronald Reagan? Or the towering iron-willed price-stablizer and central banker Paul Volcker? In Reagan’s last full year in office, 1988, the CPI was rising at 4.4%. Inflation then accelerated to 4.6% the next year. President Obama and Fed Chief Janet Yellen (and Fischer) make Reagan and Volcker look about as tight with money as wastrel winos headed to the corner liquor store. I will leave it to pathological sociologists to explain the current phobia about inflation (as dubiously measured, no less). It is certainly not about macroeconomics. 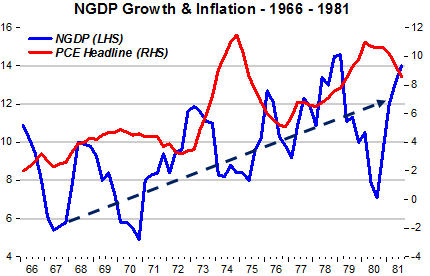 I just wish we could get back to 1980s and 1990s, when the U.S. had robust growth and moderate inflation. Seems like a long, long time ago now. In the current absence of the excellent Britmouse we shall have to start covering UK NGDP here at this site. He was getting a bit overoptimistic anyway. And it is not good news this week. 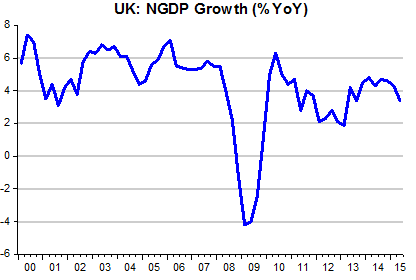 The first estimate release of GVA (a cut down version of NGDP) last month had warned of a sharp slowdown in NGDP in the UK during 2Q. This was confirmed. 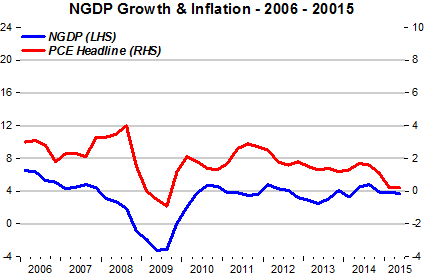 Money is tight in the UK and yet we have the same “normalization” charade from our own MPC that we see at the Fed. 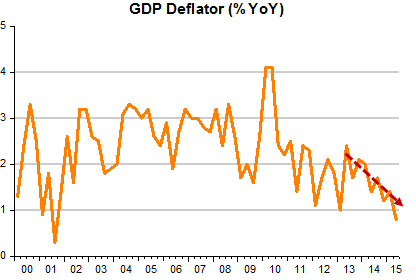 The “inflation” that the MPC should be worried about is worryingly low and going lower as shown in the Implied GDP deflator. For sure there has finally been some modest pick-up private sector wage growth, as in the US. But, as in the US, too, the capitalist classes seem to want to stop prosperity spreading to the masses by active monetary tightening. These hawks should be careful of what they wish for … Syriza, Podemos, Jermey Corbyn and Trump/Sanders mania. 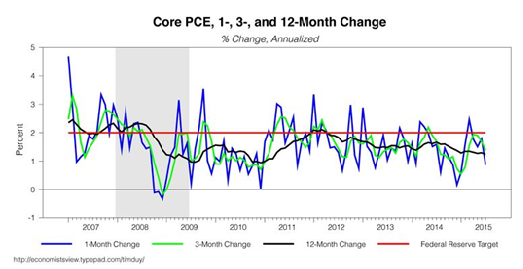 I wonder whether Governor Carney will be reflecting the “normalization” mania or looking at the (real) nominal data this morning in his Jackson Hole party piece? Decisive women & Hesitant men!